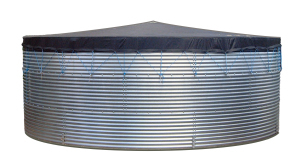 Galvanised corrugated steel tanks designed specifically to hold large quantities of water. The Steel is approved to BS2989:1982 and is galvanised with lead free zinc to 275g/m2 to EN10142. All tanks have a safety margin of 40% – this means that the structure is capable of holding a minimum of 40% more than the tanks actual volume. Many sizes available – from 9000 litres – 1’000’000 litres of water. Special sizes upto 2000m2 avialable. Green Coated tank finish available. We offer a vast range of tank sizes varying from 9′ diameter to 69′ (2.74 metres – 21.03 metres) with varying tank heights. 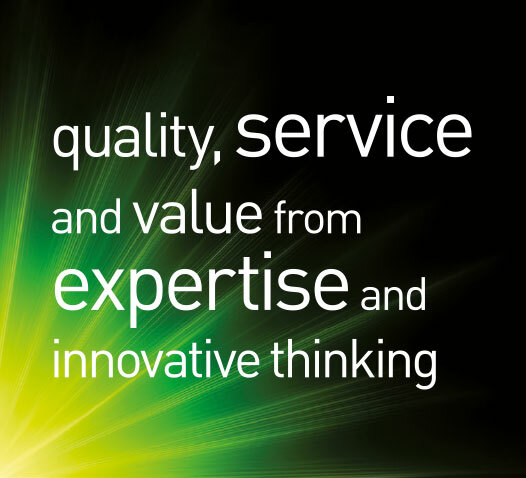 For more information on tank dimensions please contact our sales team today with your requirements. 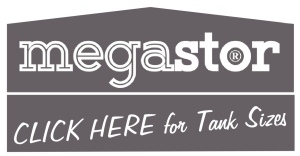 Coated Galvanised Steel Tanks, Roofs and accessories. Powder coated tanks have many advantages. By coating this can increase the life expectancy of a standard tank by up to 50%. 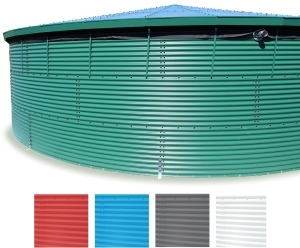 Any colour can be appliedto the tank range including the galvanised roof and tank. 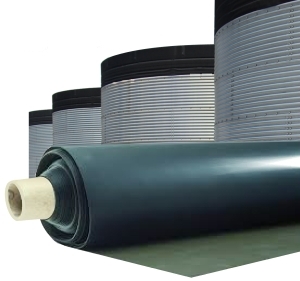 We offer a range of different Tank liners to suit most applications; EPDM, Butyl, polypropylene, PVC and Tropic PVC. The most common liners being EPDM and Butyl. EPDM is popular due to the fact that it is a very strong material yet flexible with good UV resistance. It is very competitively priced and typically used for Rainwater Harvesting, Fire fighting water storage, Irrigation etc. Butyl is used as it is suitable for storing drinking water and is flexible, robust and UV resistant. For more information please contact us. Our Woven Polypropylene Anti-Algae cover is designed to cover and overlap the top edge of the tank. 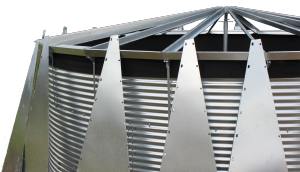 The woven Polypropylene material offers excellent UV protection preventing Algae growth, prevents wind-bourne debris entering the tank and allows rainwater to permeate through. A strehgthened top seam sits on the top edge with a skirt tightly fitting around the top ring of the tank. Secured with adjustable straps that attach to supplied eyebolts. This Cover is an ideal solution where algae is a problem and the water need to be protected against UV and wind bourne debris. 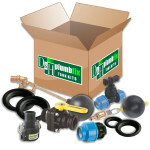 This cover kit is supplied complete with; Centre poles (on tanks over 18′ or 5.47 metres) or larger, Ball valve flap which allows access and installation of ball cok float fill valve (Also a good sampling point) and 1x top support ring as a recommended option to improve stability in high wind or heavy rainfall areas. 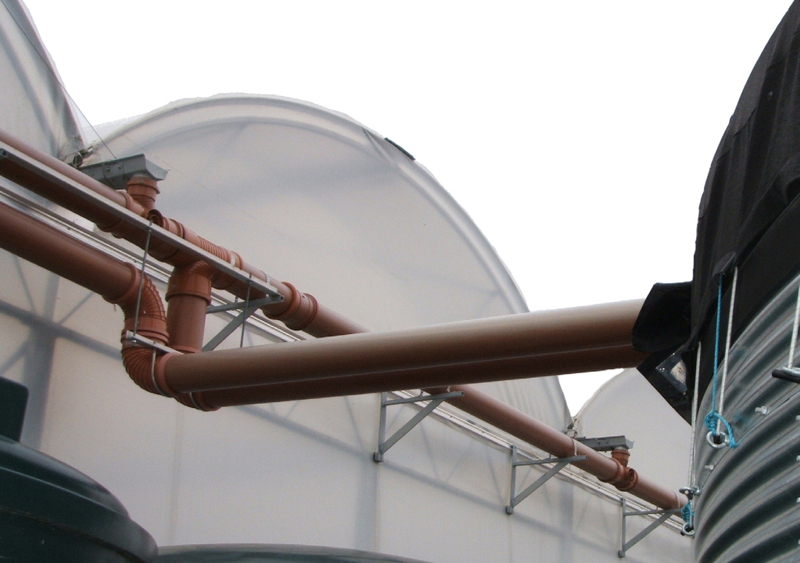 PVC Covers are extremely strong, heavy duty reinforced material that prevents algae growth, wind-bourne debris and rainwater from entering the storgae tank. It has been designed to overlap the top edge of the tank. Prevents algae growth and Rainwater from entering storage tank. A heavy duty tailored PVC water tank cover draped over a centre support structure which is held in position and tesioned throughout, using Polypropylene guy ropes attached to Galvanised eyebolts. 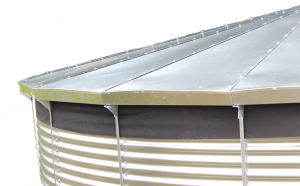 Galvanised tank covers are available for tank diameters of upto 48′ (14.63 metres) and are supplied with two access hatches and a ball valve bracket. Galvanised covers prevents algae growth, stops evaporation, and acts as a barrier to rainwater and wind bourne debris. Designed to withstand UK wind and snow loadings this option is extremely strong and looks aesthetically pleasing. 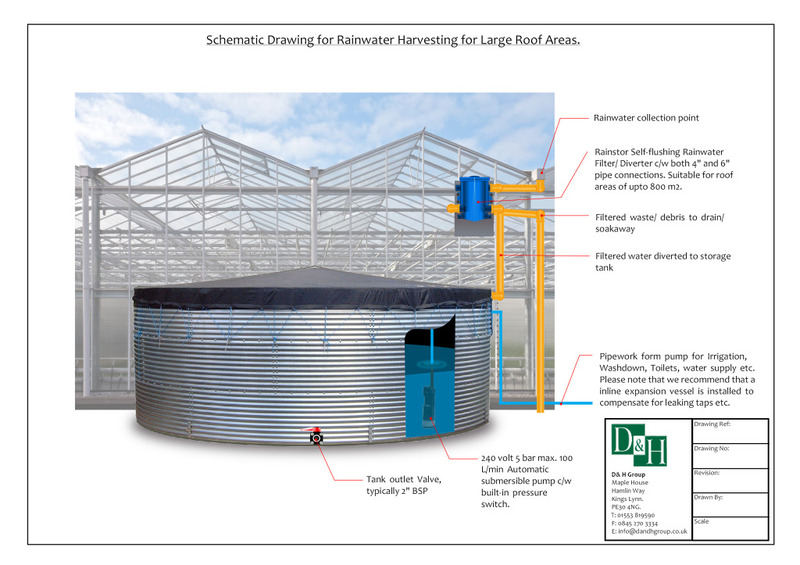 Shematic drawing of Megastor Water Tanks used for Rainwater Harvesting from Large roof areas. For more information ‘click‘ image above. The above image shows a simple Rainwater Harvesting system. The downpipes are diverted to the Megastor water storage tank. As the water diverts straight into the tank, the Rainwater is then pump out through a fine mesh filter unit. 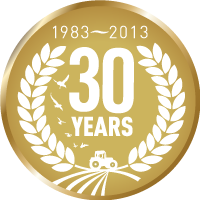 We offer an extensive range of accessories for all our tanks including, Valves, pipework and fittings. For more information please contact us.